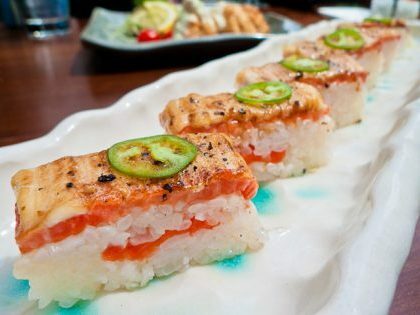 Miku specializes in Aburi, or flamed-seared sushi, which was developed nearly a century ago in Japan. The act of directly applying fire, lightly searing the sushi, enhances the natural flavours and textures of the fish. 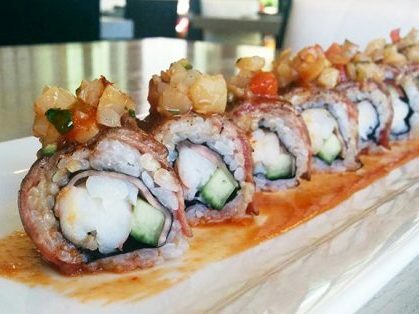 Miku owner Seigo Nakamura innovated the Aburi concept by crafting specialty sauces using non-traditional Japanese ingredients to pair with each type of fish. The light sear from the binchotan (Japanese bamboo charcoal) then caramelizes the sauce, releasing a smoky aroma and bringing out the finest flavours in each piece of Aburi sushi.